Wheat occupies a special place in the mind of anyone who grew up surrounded by western cuisine. Wheat is the source of bread, and bread is intrinsic to our concept of food. In the same way rice, in all it’s many gorgeous and delicious incarnations, is central the the idea of food in south indian and east asian cultures. Or corn tortillas in mexico. Human civilization was built upon of the unrivaled productivity of these three grains. 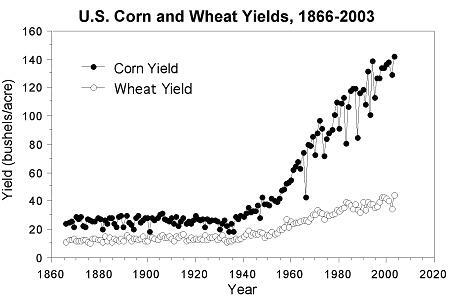 And when modern medicine increased the rate of population growth, it was primarily these three grains (and wheat first of all) that we turned to in the green revolution to fill the gap between what current farming methods could produce and what was needed to save our fellow human beings from starvation. In the US the technologies that made the green revolution possible, were available earlier. Around the end of world war two, most of the infrastructure that had been built up to fight the war could be turned over to peaceful uses, one of which was man-made nitrogen fertilizer. Nitrogen, for centuries on of the major limits of yield was now available in quantities that couldn’t have even been dreamt about at the turn of the century. At the same time, hybrid corn seed* began to be available in substantial quantities from, among other sources, Pioneer Hi-bred. And how it looks like wheat may once again miss out on new advances in the form of genetic engineering. GM maize was one of the first crops brought to market and as been an agricultural (if not public relations) success. I’m not sure if GM rice is on the market or not, but I do know many lines are in development from golden rice that addresses the vitamin A deficiencies found in people dependent on rice for almost all their calories****, to rice that can be irrigated with brackish (salty) water where fresh water is scarce, to flood resistant rice that can thrive what fresh water is TOO abundant. I know of no one planning to release GM wheat and even wheat genomics is far behind the rice and maize communities. The problem from a genomicist is that each bread wheat cell how contains 42 chromosomes. Remember each of the grass species that gave rise to wheats had seven chromosomes, each with two copies for 14 chromosomes per cell. Seven chromosomes each from of its parents (for 21) and two copies of each brings us to 42. Which is still four less than human cells, so where’s the problem? The different from the human genome is that each of set of seven chromosomes makes up a closely related yet distinct genome. So as bits of DNA are sequenced it is hard to know whether the pieces their overlap are really from the same part of the genome, or instead related sequences from one of wheats other parents (and located on an entirely separate chromosome). Imagine a giant heap of puzzle pieces from three puzzles each made with identically shaped pieces and make very similar pictures although you don’t know what any of the pictures will look like. That’s what trying to sequence the wheat genome would be like. But a complicated (and awesome) genome isn’t the only thing holding back wheat research. After all GM maize has been on the market for more than a decade and the genome hasn’t been available until recently and still hasn’t been officially published. The other major barrier is a side effect of wheat’s success and cultural status. Corn is essential to feeding Americans (and Europeans) every day, but we don’t see it as most of it is camouflaged in cornfed beef and pork, and hidden in the ingredient lists of processed foods. Rice feeds people directly, but far to many of the people who depend on it are more worried about whether they’ll have enough to feed themselves and their children than the techniques used the harvests don’t fail, and yields increase. Wheat on the other hand mostly eaten in recognizable forms like bread and pasta and much of it is consumed by people who are a generation or more removed from the sort of food insecurity that still plagues hundreds of millions around the globe. These are people, like myself, who can say, “this new technology feels wrong” because the difference for them is a few more quarters for a loaf of bread, not whether they have to spend the money that could have gone to sending one of their children to school on food, or whether they can feed all their children at all. And that’s the reason no one is investing in biotech wheat. Saving a little money on production, or even reducing the use of the most toxic pesticides and/or reducing topsoil loss by being able to switch to no-till farming, hasn’t been worth the risk to farmers that their harvest will become worthless if consumers refuse to purchase GM bread. Without the demand from farmers, seed companies won’t invest the resources, and even with the demand, they’d weigh the profit of selling the seed against the risk of stirring up more opposition among consumers. Monsanto really doesn’t need any more negative publicity. **To make a hybrid you have to mate two dissimilar parents. To do that with plants, you often have to prevent the plants from mating with themselves. This is a simple process for corn since the female flowers (the ears) are physically separate from the male flowers (the tassel). All thats required to to bus a bunch of high school kids willing to work for minimum wage out to a cornfield, and have them walk down the rows pulling the tops off of the “female” parent. After the females are pollinated by the “male” parent, the male plants (which still have both male and female flowers) are chopped down to allow more light to reach the female plants and at harvest, and the seeds are hybrid since their female parent must be the plant they’re growing on, and their male parent can only be corn plants that kept their tops (and tassels). Now imagine how much work it would be to go through a field of, say tomatoes, with a magnifying glass and a pair of tweezers removing only the male parts of each flower and leaving it otherwise intact. ***I’ve heard there’s actually been some success recently with producing hybrid rice using CMS. Cytoplasmic male sterility is a mutation carried in one of the organelle genomes (the small genomes of the chloroplast and mitocondria) which keeps plants from producing pollen (plant sperm). Because the cytoplasm of an embryo (whether cucumber or human) comes from only the mother, CMS traits are passed from a mother to all offspring. So you have a female inbred that’s male sterile and when you grow it with a normal you know all the seeds on the female plants must be hybrid since the only pollen avaliable to fertilize them was from the other inbred line. It’s even more complicated than my confused explanantion makes it sound, but it’s a lot better than hiring people to go out their with magnifying glasses and tweezers. ****We don’t have to worry about that particular problem with corn since the vast majority of corn grown in the US carries a gene which produced carrotinoids (vitamin A precoursors) in the kernals. Before plant breeders started selecting for that trait, most corn we grew was white. Of course if you go even further back, corn looked all sorts of different ways. *****Durum wheat which is still used for making pasta and for some traditional breads in the middleeast survived competition from bread wheats and is one of the few remaining agriculturally significant tetraploid wheats. Wheat occupies a special place in the mind of anyone who grew up surrounded by western cuisine. Wheat is the source of bread, and bread is intrinsic to our concept of food. In the same way rice, in all it’s many gorgeous and delicious incarnations, is central the the idea of food in south indian and east asian cultures. Or corn tortillas in mexico. Human civilization was built upon of the unrivaled productivity of these three grains. And when modern medicine increased the rate of population growth, it was primarily these three grains (and wheat first of all) that we turned to in the green revolution to fill the gap between what current farming methods could produce and what was needed to save our fellow human beings from starvation. Yet wheat is falling behind the other members of the big three grains. The technologies that made the green revolution possible were available earlier in the US than elsewhere. Around the end of world war two, most of the infrastructure that had been built up to fight the war could be turned over to peaceful uses, one of which was producing man-made nitrogen fertilizer. Nitrogen, for centuries on of the major limits of yield, was now available in quantities that couldn’t have even been dreamt about at the turn of past century. At the same time, hybrid corn seed* began to be available in substantial quantities from, among other sources, Pioneer Hi-bred. View this graph in it’s original context here. And now it looks like wheat may once again miss out on new advances in the form of genetic engineering. GM maize was one of the first crops brought to market and the GM traits have been an agricultural (if not public relations) success. I don’t know of any GM rice currently on the market but I do know many lines are in development from golden rice that addresses the vitamin A deficiencies found in people dependent on rice for almost all their calories****, to rice that can tolerate salt water or drought where fresh water is scarce, to flood resistant rice that can thrive what fresh water is TOO abundant. On the other hand no seed company (to the best of my knowledge) in the US is planning to release GM wheat and wheat genomics is far behind the rice and maize communities. I’ll post an entry tomorrow (seriously, I’ve already written the entry) about wheat’s awesome family tree and the complex and resilient genome that resulted. But a complicated (and awesome) genome isn’t the only thing holding back wheat research. After all GM maize has been on the market for more than a decade and the genome hasn’t been available until recently and still hasn’t been officially published. The other major barrier is a side-effect of wheat’s success and cultural status. Corn is essential to feeding Americans (and Europeans) every day, but we don’t see it as most of it is camouflaged in cornfed beef and pork, and hidden in the ingredient lists of processed foods. Rice feeds people directly, but far to many of the people who depend on it are more worried about whether they’ll have enough to feed themselves and their children than the techniques used so the harvests don’t fail, and yields increase. Wheat on the other hand mostly eaten in recognizable forms like bread and pasta and much of it is consumed by people who are a generation or more removed from the sort of food insecurity that still plagues hundreds of millions around the globe. These are people, like myself, who can afford to say, “I’m avoiding this new technology because it feels wrong.” The difference for us is a few more quarters for a loaf of bread, not whether we have to spend the money that could have gone to sending one of our children to school on food, or whether we can feed all our children at all. And that’s the reason no one (outside of China) is investing in biotech wheat. Saving a little money on production, or even reducing the use of the most toxic pesticides and/or reducing topsoil loss by being able to switch to no-till farming, hasn’t been worth the risk to farmers that their harvest will become worthless if consumers refuse to purchase GM bread. Without the demand from farmers, seed companies won’t invest the resources, and even with the demand, they’d weigh the profit of selling the seed against the risk of stirring up more opposition among consumers. Corn and soybeans varieties whose transgenic traits allow them to adapt to drier climates are making those crops more competitive for farmers to grow than wheat. … Planted acreage for corn rose to 4.10 million acres; the greatest number of acres planted into corn in Kansas since 1936. Either wheat becomes more productive, or it ends up being outcompeted by more productive corn. Either way, more food is produced from a given acre, the free market in action. ****We don’t have to worry about that particular problem with corn since the vast majority of corn grown in the US carries a gene which produced carrotinoids (vitamin A precoursors) in the kernals. Before plant breeders started selecting for that trait, most corn we grew was white. Of course if you go even further back, corn looked all kinds of cool. Polyploidy is definitely an issue from a genomics standpoint, but I don’t think it’s holding wheat back from a breeding or genetic engineering standpoint. And C4 photosynthesis beats C3 any day (especially with global warming) but aside from Corn, which is of course awesome, the only two significant non-C3 crops I can name are Sorghum and Sugar Cane, though it looks like Sorghum may be going through a renaissance in American farmland.